When Was the Last Time I Paid For a Haircut? Sometime in my junior year of college is when my frugality muscles really started bulging. That year I lived in a church (it had apartments in it) and paid almost nothing for rent in exchange with helping out with activities. I lived close to a Wal-Mart, where I shopped often of course. While I perused the aisles one day, I found a Conair hair cutting set for $30 and bought it. My idea was that if I cut my own hair three times then I basically paid for the set. After all, it came with an electric razor too, which I needed anyway. Little did I know that I would become a lifetime personal barber. I cannot even remember the last time I paid for a haircut. Unless you go to Cuts-R-Us with a coupon, you will have a hard time walking out of a barbershop for less than $15 after tax and tip. If you routinely pay less, please let me know in the comments. While I love the small talk I used to have with barbers, getting a haircut is equivalent to two nice lunches at work. If I got one every two weeks while I was in corporate America like most men in business, I would have shelled out an entire week’s lunch budget on my head. I started in college because I felt like I would cause minimal damage. Namely, that if I show up to class with a bizarre lump of hair still remaining on the back of my head, then the worst that could happen is people would think I was a little weird. In the corporate world, a slovenly look could cost you a good performance review or promotion. OK, so I’m not as good as a professional barber, but none of my friends seem to know. I have had dozens of people compliment my new haircut or just notice that I had had one. None of them assumed I had done it myself. If you took the plunge tomorrow, you might mess up a few times. 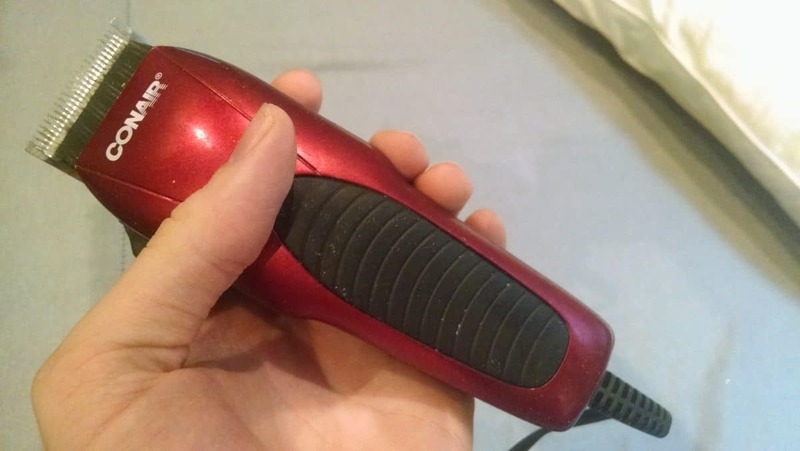 The key lesson I learned is to start with a really high number on the shaver like a 5 or 6 all around first. Avoid the front of the hair as you might want to use scissors. You can always take more off, but you can’t add more hair if you make a mistake. Today, I know almost by memory the measurements I use. Depending on how short I want it, I’ll use a 2 or 3 on the sides, a 4 in back, a 5 in the middle section, then a 6 or 7 for the front part. After that, I use my razor to take care of the ear line, sideburns, and random wiry hairs sticking up. Unless you consistently dye your hair or want a specific look (JT with the blond spikes anyone? ), I think you would learn to love a specific style and stick with it. How Many Times did you use a professional barber in the US in the past Six years? To be honest, I can’t even remember the last time I paid for a haircut in the US. I think I might have paid for one cut in the US one time in the past six years, and that might have been for a wedding when I forgot my set at home. If you assume that I would spend $15 getting my hair cut twice a month, I saved $2,145 by cutting my own hair. In fact, I saved more. I needed to earn about $3,000 to take home that amount of money. Furthermore, you should penalize that spending by what you would have had if you invested in the stock market instead. That means the true savings from cutting my own hair is something like $5,000. That means the $30 I spent on my Conair haircut set earned me a return of about 134% a year. I smoked even Warren Buffet by cutting my own hair! What about my opportunity cost you say? It would have taken me more time to go to the barbershop and get back than it did to cut my hair. Even if you toss in the time I had to buy Drain-O because I let some of the hair clog the sink, the rate of return is still more than 100% a year. Try getting that in the stock market. I choose not to pay for professional haircuts in the US because I feel like I can do a good job myself. Moreover, the cost is pretty high. When I traveled the world this year, I took full advantage of rock bottom labor prices to obtain top quality hair care at a fraction of the cost. 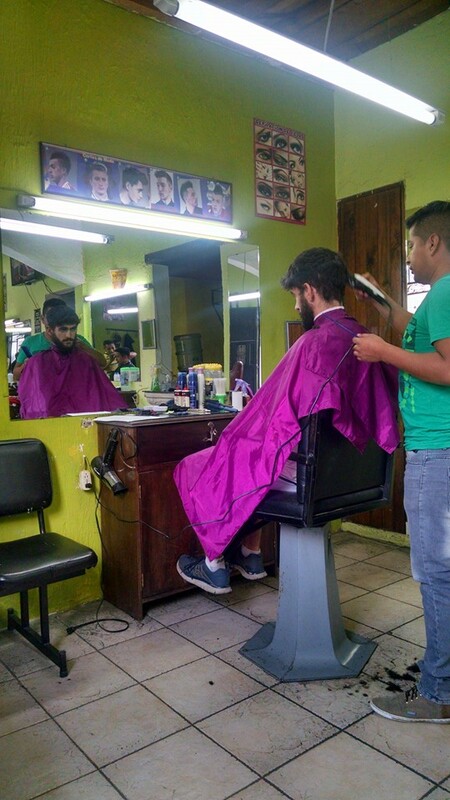 In Guatemala, I asked my buddy for a suggestion and he sent me to this wonderful place that did a full shave, haircut, shampoo, and conditioning for $4 including the tip I gave the guy. The covering I wore was particularly comfortable and a nice flashy pink color too. That experience was nothing compared with when I was in Moldova. I needed a haircut pretty badly after two months on the road. I went around the central market asking if anybody knew about a barber shop, using my hands to pantomime what I needed. They described it for me but I walked into the building next to it first, which happened to be a skin care center. Finally, I found my way to the barbershop. The ladies there did not speak one word of English. Nothing. Nada. Zilch. I just gave them a thumbs up and said ‘Tom Cruise,’ thinking that they would know what to do. They spent about a half hour with me, deep shampooing my hair, using thinning scissors, and really doing a fantastic job. It was by far the best haircut I’ve ever had. I gave her a $5 equivalent bill and she handed me back $3. I couldn’t believe it! The cut only cost $2!!! I handed her back $1 for a tip. Apparently people don’t tip for haircuts in Moldova, because it was like her eyes welled up with tears as if I’d just changed her life over an extra $1. Take a risk and save thousands of dollars with minimal effort. I highly suggest you buy a haircut set for yourself. Apparently there has been negative inflation in haircut set prices since I got ripped off on my $30 set at Walmart. Amazon sells a basic 10 piece kit for $7.99. Hopefully be using this haircut set a lot. Therefore, you might as well spend some more money for a better set. This one I found from Wahl on Amazon has great reviews. It costs a little over $20 and is one of the top sellers in the entire beauty products category. I don’t know what you would do with all the 24 pieces it comes with, but I imagine it will make you look really good. Finally, if you want to spend a little more for something that looks really cool, the Remington vacuum set is only $40. I imagine this means much less of a mess when it comes time to clean up. I’d go with the middle option if I had to buy another haircut set. I’m so glad I can’t remember the last time I paid for a haircut. I learned a valuable skill and saved thousands of dollars doing this. If you buy one of the sets above, Millennial Moola gets a small commission from Amazon. More importantly, you could get a 100%+ return on investment. Become more successful than the world’s best hedge fund manager and cut your own hair. I don’t think we will stop paying to get our hair cut any time soon. I’m pretty sure we would mess ours up big time! =) Then again, we don’t go to fancy salons or anything so the cost isn’t a problem. I must be a bad influence in your life, since I was there for 2 of the last 3 professional haircuts you mentioned. I only cut mine every 6-7 weeks so I don’t mind spending the $14 per cut. Once my hair is finally gone though, I am sure I will switch to doing it at home but that time hasn’t come yet! This was the first time in 4 years I had to pay for my hair to be cut. I used to get a buddy of mine to cut my hair but he moved out of state so I had to find a cheap place to cut my hair once every month. Please remember that you decided to start cutting your own hair after you had all of the girls at the church do it for you first. You’re welcome 🙂 I’m glad that you learned how to do it yourself. U certainly cut down on the terrible haircuts I did in the beginning . thanks for doing that!